I am happy to say that I have moved to Kingston, Ontario (from Toronto), which has been a long-standing goal for my partner and me. Although it was sad to say goodbye to the wonderful team at Oma Chiropractic, and to my dedicated clients, I am excited and hopeful about this change. I have re-started my practice as part of a multi-disciplinary wellness team at Live Well Centre in downtown Kingston, where I am available for therapeutic massage, acupuncture and Kinesio Taping Wednesday through Friday. I am also available on Mondays and Tuesdays at my home clinic in mid-town Kingston (Brock & Sir John A. area). Click here to book an appointment at my home clinic. In-home massage therapy is also available (at your home), please call me to discuss: 613-879-4965. I am looking forward to meeting new clients in Kingston and making this lovely city my new home! I am excited to announce that I have successfully completed the Contemporary Medical Acupuncture program at McMaster University. I am looking forward to providing acupuncture treatments to my current and new clients, both as part of a massage therapy session and as a stand-alone treatment option. Acupuncture is the medical practice of inserting small thin needles into various points in the body, including hands, feet and scalp, to be left in place for a period of time before removal. At times the practitioner may attach a small electrical device to one or more needles to aid in treatment. I usually use electrical input to increase the benefits of the acupuncture treatment. 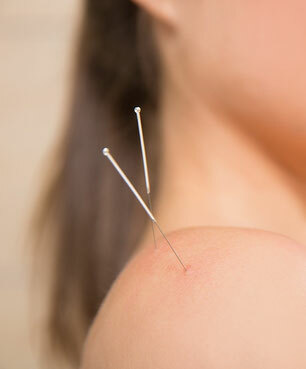 Acupuncture produces many of its effects by stimulating nerve receptors in skin and muscle. Acupuncture has been found to reduce pain, create a calming effect and increase a sense of well-being, inactivate myofascial trigger points that cause pain, and produce positive effects on the brain. The benefits of acupuncture accumulate with repeated treatments. The contemporary scientific explanation of acupuncture is that needling certain points in the body stimulates the nervous system to release chemicals in the brain, spinal cord and muscles. These chemicals will change the experience of pain, or they will trigger the release of other chemicals and hormones which influence the body's own internal regulating system. The improved energy and biochemical balance produced by acupuncture results in stimulating the body's natural healing abilities, and promoting physical and emotional well-being. How does Contemporary Medical Acupuncture differ from Traditional Chinese Acupuncture? At first glance, Contemporary Acupuncture may look strikingly similar to traditional Chinese acupuncture. However, considerable differences exist between Contemporary Acupuncture theory and the traditional Chinese approach. In contemporary acupuncture, your practitioner (physician, massage therapist, chiropractor, etc.) treats you only after a conventional medical/neuro-functional diagnosis has been made. The practitioner will use acupuncture as a treatment modality along with other therapeutic approaches, as needed. For example, I will be using acupuncture in combination with massage therapy. The contemporary acupuncture practitioner applies treatment following a conventional (scientific) view and regards the acupuncture as having certain local tissue and nervous system effects. In contrast, a traditional Chinese acupuncturist makes a diagnosis in terms of complex theories regarding disturbance in the body’s balance that needs to be corrected with needles. These imbalances will often be characterized by excess or deficiency with respect to what are considered the five elements, water, fire, earth, metal and wood. Traditional Chinese acupuncturists subscribe to the theory that certain points in the body are characterized by each of the five elements. To book an appointment for massage therapy and/or acupuncture with Simon, call Oma Chiropractic at (416) 469-0369 or book online. Extreme cold weather can contribute to fatigue, winter illnesses and aching muscles and joints. Don't let winter get the best of you. Follow these tips and take good care of yourself and your loved ones in these last frosty weeks of the year. Exposure to less sunlight in the winter makes your brain produce more melatonin, which is a hormone that makes you sleepy. In addition, the longer winter nights have a tendency to disrupt your sleep cycle, leading to fatigue. Two key ways to fight fatigue are getting enough sunlight and ensuring you get a good night's rest. Get outdoors in natural daylight as much as possible, for example, getting a short walk in on your lunch break. To get better sleep, try sticking to a regular sleep schedule, going to bed and waking up at the same time each day. With shorter daylight hours, you may feel particularly stressed to get everything done in a day. There is no quick fix for stress; rather, look for habits you can incorporate into your busy life to alleviate stress over time. Mindfulness activities such as meditation, breathing exercises and yoga are a good start. During cold & flu season, it is more important than ever to ensure your immune system is strong. Eat a balanced diet, including a variety of fruits and vegetables, spend time outdoors in natural sunlight, and stay active. Cold weather is no reason to put your exercise routine on hold. To stay motivated, try outdoor activities that make winter more fun! Cross country skiing, tobogganing (all that running up the hill!) and even a brisk nature walk are great choices. Warming up prior to outdoor activities is even more important in cold weather. Before you leave the house, do some light dynamic stretching, mirroring the activity you are about to engage in. You can gradually increase the speed and range of motion to get yourself properly warmed up, but try to avoid getting sweaty before heading out of the door. Did you know? Bloor West Homeopathic & Wellness Clinic now has weekend Massage Therapy available (Saturdays 10am-5pm and Sundays 10am-3pm) and we welcome walk-ins! So why not stop by on Saturday afternoon after your brisk walk along Bloor street? Notice how you brace yourself against the cold wind, tensing up your neck and shoulders. No wonder sore upper body muscles is a chief complaint I hear from my clients in the winter. If you suffer from rheumatoid arthritis, you know that cold weather can also impact your joint pain level. (Guedj, 1990) Add to this the common injuries caused by slipping on ice or shovelling snow, and you can see why caring for your muscles and joints in the winter is a priority. Did you know? Not only does Massage Therapy work directly on stressed muscle tissue, it can also help improve circulation during cold weather (Mori, 2004), helping bring more fluids and oxygen to the tissue to improve healing. Stay warm and healthy these last few weeks of winter! Cady, Steven H., and Gwen E. Jones. "Massage therapy as a workplace intervention for reduction of stress." Perceptual and Motor Skills 84.1 (1997): 157-158. Field, Tiffany, et al. "Lower back pain and sleep disturbance are reduced following massage therapy." Journal of Bodywork and Movement Therapies 11.2 (2007): 141-145. Ironson, Gail, et al. "Massage therapy is associated with enhancement of the immune system's cytotoxic capacity." International Journal of Neuroscience 84.1-4 (1996): 205-217. Mori, Hidetoshi, et al. "Effect of massage on blood flow and muscle fatigue following isometric lumbar exercise." Annals of Transplantation 10.5 (2004): CR173-CR178. This February, as part of my massage treatments at Oma Chiropractic, I will be offering free cold laser treatments ($25 value) to assist my clients with recovery from injury, pain or inflammation. I have been interested in laser treatment technology for a while, and am very excited to now be able to offer this service. 3) speeding up the body's natural healing processes. Theralase laser therapy is safe, effective (up to 90% effectiveness) and painless, with results which are often immediate with no side effects. Cold laser therapy is non-invasive: the lasers used for tissue stimulation are not strong enough to damage cells. In fact, you will not feel any sensation from the laser beams. 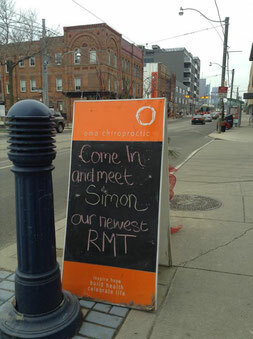 I am excited to be adding to my practice by joining the team at Oma Chiropractic in Leslieville. I will still be available at Bloor West Homeopathic & Wellness Clinic on Wednesdays, Saturdays & Sundays, but I can now also be found at Oma Chiropractic on Mondays, Tuesdays and Fridays. See my detailed working hours here. You can book an appointment by calling Oma Chiropractic at (416) 469-0369 or online. I am looking forward to making new connections in Leslieville and helping more clients live a pain-free, active life. Wishing you and your family happy & healthy holidays. Kinesio Taping is not just for athletes. In fact, Kinesio Taping can successfully treat a vast range of everyday conditions from headaches to foot problems, and everything in between. It is a time-tested, therapeutic taping method that uses a uniquely designed hypoallergenic elastic tape. Kinesio Taping is used to re-educate the neuromuscular system, reduce pain, optimize performance, prevent injury and promote circulation and healing. The reason I love Kinesio Taping is that it continues the therapeutic benefit of the treatment for prolonged periods of time in between appointments. The tape is intended to be kept on for several days, and so continues to work as you go about your life. Kinesio Taping can be used to help treat conditions like carpal tunnel, tendinitis, tennis and golf elbow, runner’s knee, as well as any sprains and strains. Kinesio Tape can even help with large bruises and lymphatic drainage. The Kinesio Taping Method is designed to facilitate the body’s natural healing process, while adding support and stability to muscles and joints without restricting the body’s range of motion. This is how Kinesio Tape is different from regular sport tape; while sport tape is not flexible and is used to hold joints in place without allowing mobility, Kinesio Tape provides support, but is also elastic to accommodate your body’s movement. I will be using this modality with my massage therapy clients where it fits with the treatment plan. This month I am including Kinesio Taping as part of my treatment at no extra cost. If you are interested in just coming in to exclusively get taped for your particular condition (not as part of a massage treatment), I am available to do that as well. Those visits will have a small fee, but will add great value to your active lifestyle. Wishing everyone health, wholeness and speedy recoveries.